Recent release “The Adventures of Pugsley the Pug and Trucker Joe: Six Puggies in a Gymbag” from Page Publishing author Carmen Oliva is the jubilant tale of Trucker Joe and his sidekick pug-Pugsley on their mission to deliver loads while also finding the perfect homes for the pug puppies. Carmen Oliva, a native New Yorker who has relocated to Georgia, has completed her new book “The Adventures of Pugsley the Pug and Trucker Joe: Six Puggies in a Gymbag”. It is the tale of a trucker and his pug companion completing their deliveries while simultaneously finding a loving environment for the pups they have rescued off the side of the road. Published by New York City-based Page Publishing, Carmen Oliva’s inspiring tale of two friends who multi-task to finish their job while saving six puppies in the process is one of hope and solidarity. Pugsley the Pug and Trucker Joe save the day by successfully finding a loving home for the pups, while also presenting the therapeutic services of the sweet pups to a senior home. The duo successfully complete deliveries while also delivering the joy that the six pups provide to a senior facility that is thrilled to receive them. 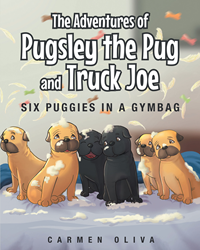 Readers who wish to experience this inspiring work can purchase “The Adventures of Pugsley the Pug and Trucker Joe: Six Puggies in a Gymbag” at bookstores everywhere, or online at the Apple iTunes store, Amazon, Google Play or Barnes and Noble.